Home | About Amsterdam | Amsterdam Coat of Arms and City Flag. What’s with the 3 X’s? Amsterdam Coat of Arms and City Flag. What’s with the 3 X’s? The Coat of Arms of the city of Amsterdam is somewhat of an enigma. Not much is known about its origins or its precise meaning. The symbolism of the heraldic shield with its three crosses in particular has been the subject of much speculation. The Amsterdam Coat of Arms. This rendition is seen on a downtown university building. 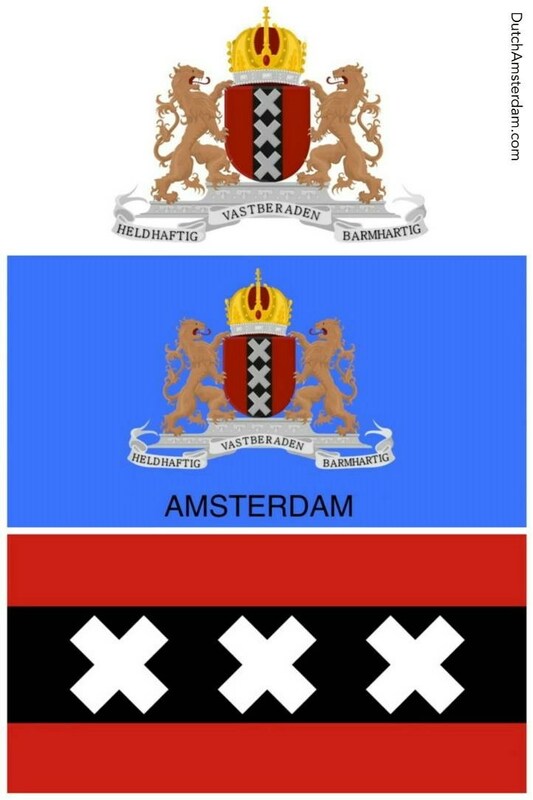 What do the 3 X’s in Amsterdam’s City Shield mean? At the heart of Amsterdam’s Coat of Arms are three white X’s displayed on a black band that runs down the middle of a red shield. (Trivia alert: such a shield is called an escutcheon). You can dismiss one frequently suggested explanation right off the bat. Forget the dated, louche image of Amsterdam as a city high on triple-X entertainment. The X’s are actually St. Andrew’s Crosses. They are named after the apostle Andrew who was martyred on an X-shaped cross in the 1st century AD. 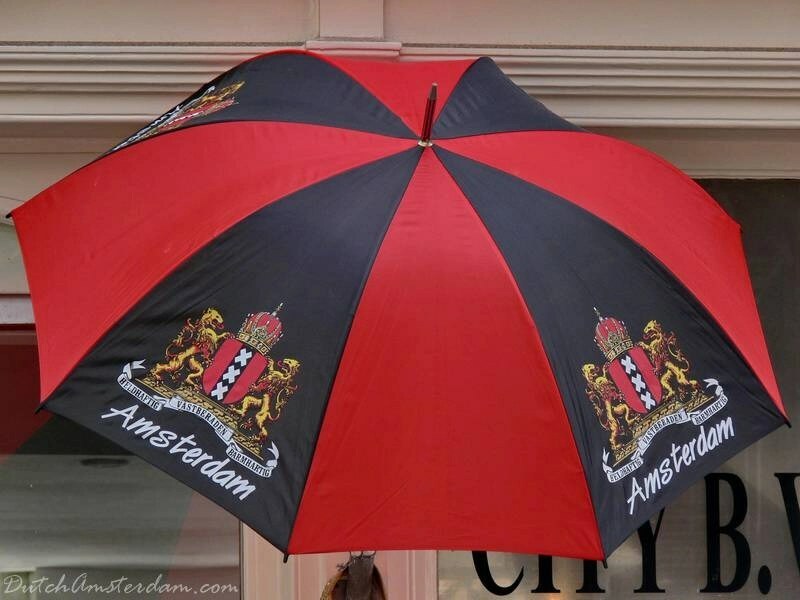 The shield is the official symbol of the City of Amsterdam. In the full coat of arms the shield appears underneath the Imperial Crown of Austria (more about that in a moment). Amsterdam’s Coat of Amsterdam carries the words Heldhaftig (Heroic), Vastberaden (Resolute), Barmhartig (Merciful). You’ll the red shield with its black banner and white crosses in one form or another throughout Amsterdam. The full version of the Coat of Arms is far less common. Many people believe that the St. Andrew’s crosses refer to the three dangers medieval Amsterdam faced: fire, floods and the Black Death. However, there is no historical evidence for that interpretation. Another possible explanation comes from titillated folks with an active imagination, who assume the three X’s refer to the city’s liberal reputation. But, as mentioned, that is not the case either. Finally, the three crosses also do not represent the words of the official motto, because that has only been in use since 1947. The motto was added in that year by then Queen Wilhelmina to commemorate the demeanor of Amsterdam’s citizens during World War II. The shield of Amsterdam is seen in various depictions, with or without the crown, throughout the city. We do know the heraldic shield has been in use for a long time. During recent construction work for the Noord/Zuidlijn (North/South metro line) workers found a pair of old pliers bearing the three crosses. Archaeologists have dated the tool to 1350 — making it the oldest instance of the emblem. Why is Maximilian’s Imperial Crown of Austria part of Amsterdam’s Coat of Arms? The heraldic origins of the coat of arms of Amsterdam are unknown. The black banner in the centre could represent the water of the rivers Amstel and IJ at which the city is located. This is the case in the case of several other Dutch cities, such as Delft and Dordrecht. The three St. Andrew’s crosses may stem from the Persijn crusader family from Waterland, which owned a considerable amount of land in and around Amsterdam. In 1489 the small merchant city obtained the right to add to its coat of arms the crown of the monarch, Maximilian I, archduke of Austria, German king and Holy Roman emperor. For the merchants of Amsterdam the crown was a weighty recommendation in other elements of the Kingdom, right down to the 17th century. By that time, Amsterdam had long been a powerful trading city in a by now Protestant country which, in 1648, was formally to leave the Holy Roman Empire of the German Nation under the Peace of Münster. 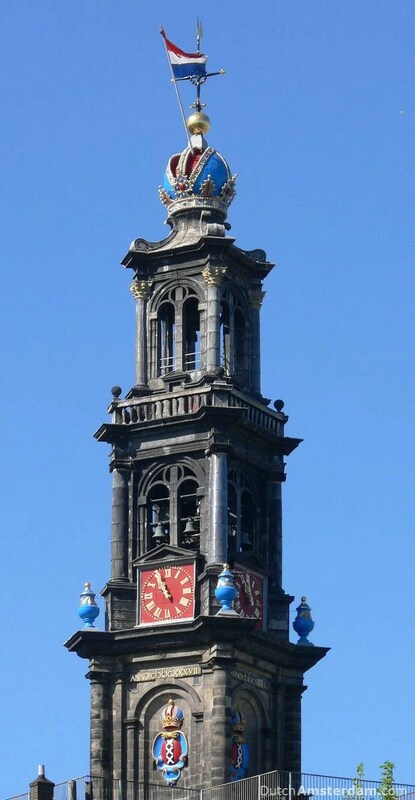 The crown adorning the emblem and the tower of the Westerkerk church is in fact the crown of emperor Rudolf II. The two lions were added as shield-bearers in the 16th century. In recognition of the conduct of the people of Amsterdam during the German occupation of 1940-1945, Queen Wilhelmina granted the city the right on 27 March 1947 to add to the coat of arms the motto ‘Valiant, Resolute, Compassionate’. Amsterdam flag alongside the flag of the Netherlands (or, as Americans would have it, Holland). Now, bear with us for a moment. The study of flags is called vexillology. An expert on flags is therefore called a vexillologist. Yes, a vex-il-lol-o-gist. Podcast host Roman Mars loves flags. 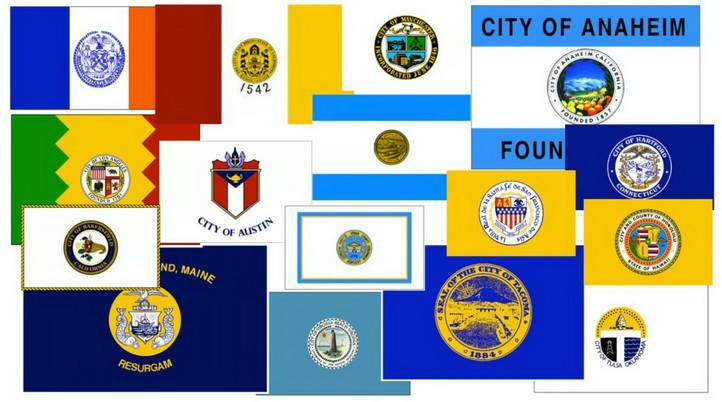 In 2015 he gave a hugely popular TED Talk on city flag design: Why city flags may be the worst-designed thing you’ve never noticed. Mars shows many examples of poorly (or even terribly) designed flags representing American cities. The European equivalent of the city seal in the city coat of arms [Shows the Amsterdam Coat of Arms]. And this is where we can learn a lesson on how to do things right. So this is the city coat of arms of Amsterdam. Now if this were a United States city, the flag would probably look like this [Shows the same coat of arms, but now on a blue background]. Rather than popping the whole code arms of Amsterdam on a solid background and writing ‘Amsterdam’ below it, it takes the key elements of the escutcheon — the shield — and they turn it into the most badass city flag in the world. And because it’s so badass, those flags and crosses are found throughout Amsterdam. The shield shows up on just about anything and everything: flags, buildings, hats, cups, underwear, napkins, and so on. You can have it tattooed on your body, buy it as jewelry, or eat it as chocolate. Once you start looking for it, you see the shield everywhere you look. It comes in many shapes and forms. How many can you photograph in a day? A unique collage of your photos would look great on Facebook, Twitter, or Instagram. Chances are you’ll buy at least one souvenir with the emblem imprinted on it. A buyer beware: the umbrellas sold in tourist/souvenir shops often don’t make it through more than a week’s worth of rain. The heraldic shield – or escutcheon – of the City of Amsterdam. Seen here on the side of house boat.